On May 11, 1990, the first meeting of the group that later became the Professional Development Consortium (PDC) was held at the offices of the American Law Institute-American Bar Association Committee on Continuing Professional Education (ALI-ABA) in Philadelphia. Titled “Training for Lawyers in the 90’s: A Meeting of In-House Training Professionals,” this first invitational event was organized by ALI-ABA and attended by 28 professionals from law firms, corporations, and government agencies across the United States and Canada. Independent from the start, participants at the meeting decided to organize a self-determining association of in-house training professionals that would meet annually or semi-annually at host law firms to discuss shared topics of interest and to support the skills building of its members. Also as part of that discussion, the group explored the then novel possibility of developing an electronic listserv for its members (later dubbed PDC-Link), hosted by the American Bar Association, and named its first Steering Committee. * At its second meeting, held at ABA Headquarters in Chicago in August 1990, the group formally adopted the name “Professional Development Consortium” and outlined the new organization’s mission, membership criteria, and leadership structure. 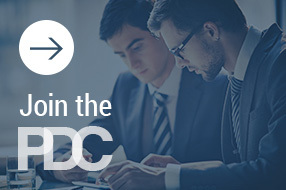 Over the next 10 years, the PDC grew in size and purpose, meeting regularly on a semi-annual basis at members’ law firms across the U.S. and Canada, then in larger venues as membership increased. Between meetings, the listserv thrived as a constant source of information and communication among members, as it still does today. * Members of the first Steering Committee were: Richard D. Lee (Morrison & Foerster), Nancy A. Volksen (Vinson & Elkins), Elise Anne Geltzer (Weil Gotshal & Manges), Elizabeth Kaufer (Stroock & Stroock & Lavan), Brenda J. Fingold (Hale & Dorr), John Claydon (Osler, Hoskin & Harcourt), Stephen V. Armstrong (Shearman & Sterling), Libby S. Saypol (Akin, Gump, Strauss, Hauer & Feld), and Jane S. Meyers (King’s County District Attorney’s Office).